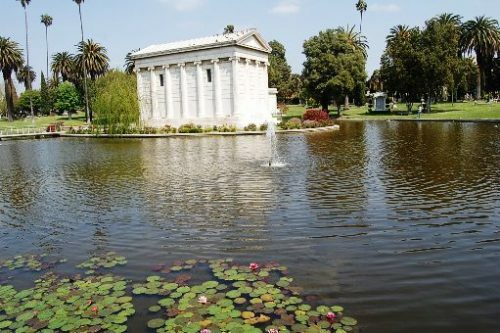 Visitors to Hollywood Forever Cemetery invariably ask who is interred in the huge mausoleum in the center of the lake. The answer is William Andrews Clark, Jr., the second son of millionaire copper-king and Montana Senator, William A. Clark, Sr. (1839-1925). Clark, a philanthropist, was founder of the Los Angeles Philharmonic (1919) and a collector of rare books. At his death, he left his library of rare books and manuscripts to the regents of UCLA. Today, the William Andrews Clark Memorial Library specializes in English literature and history from 1641 to 1800, materials related to Oscar Wilde and his associates, and fine printing. In January 1920, Clark bought the island and within a few weeks, contractors began work on the foundation of the mausoleum which is made of reinforced concrete. Clark contracted the Georgia Marble Company (Tate, Georgia) for $125,000 worth of white Georgia crystaline marble, where it was quarried but was cut here in Los Angeles. 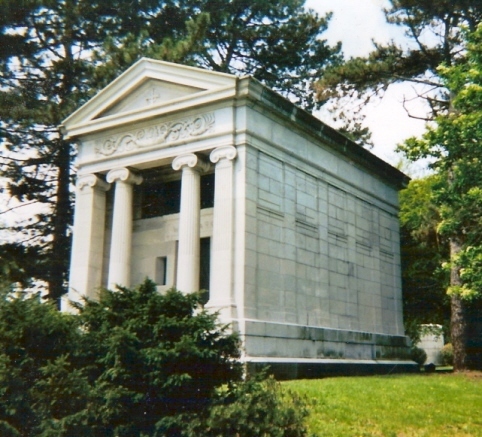 The mausoleum, which was designed by architect Robert D. Farquhar, is in the Ionic style. The pediment is all in one piece. The bronze door was cast from a model design and made by an eastern sculptor. 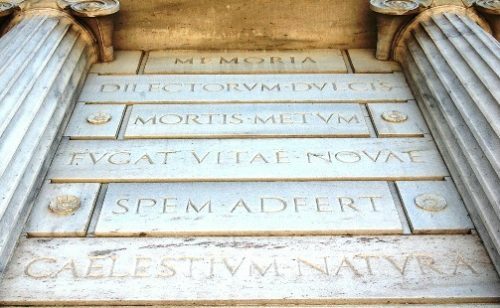 The interior of the mausoleum is finished with reddish marble and the sarcophagi, of which there are seven, are in like material. 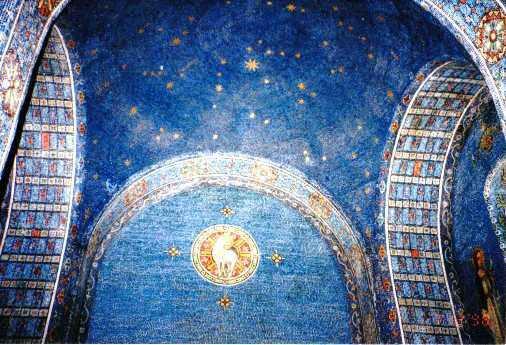 The inside dome is finished with a design worked out in mosaic of pigeon blue and old gold. 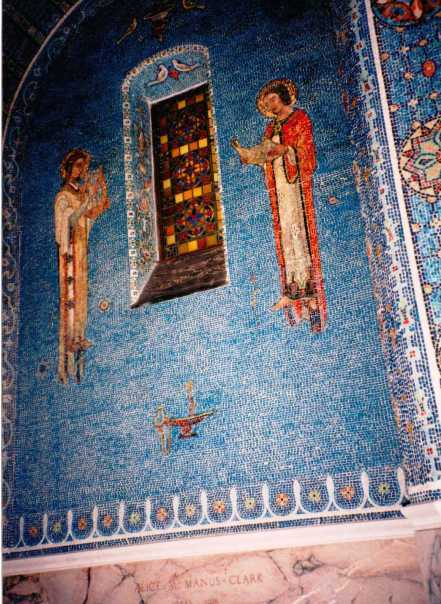 A similar mosaic is laid on the floor. The four interior stained glass windows were made by Lamm & Co. of New York. On the walls are Biblical scenes done in mosaic which 18 Italian artists labored on for 14 months. The mausoleum was completed in 1921 at a cost of more than $500,000, which includes the island site, the bridge and the lake which had palely beautiful lotus blossoms, hyacinths and lilies from far-away lands. When the mausoleum was completed, Clark transferred the body of his first wife, Mabel Foster Clark (1880-1903) to it from a vault in Butte, Montana, and also the body of his second wife, Alice McManus Clark (1884-1918) which was then resting in the family mausoleum of his uncle, J. Ross Clark, at Hollywood Cemetery. 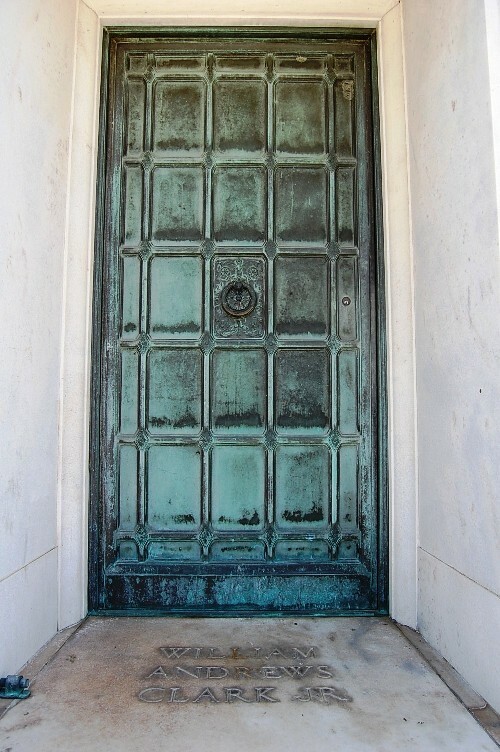 There are seven sarcophagi in the mausoleum, three on each side, and one at the head where Clark is interred. Besides his two wives, also interred there is his only son, William A. Clark III (1902-1932), who died in an airplane crash. They all preceded him in death. William Andrews Clark, Jr. died of heart disease at his summer home in Salmon Lake, Montana on June 14, 1934. 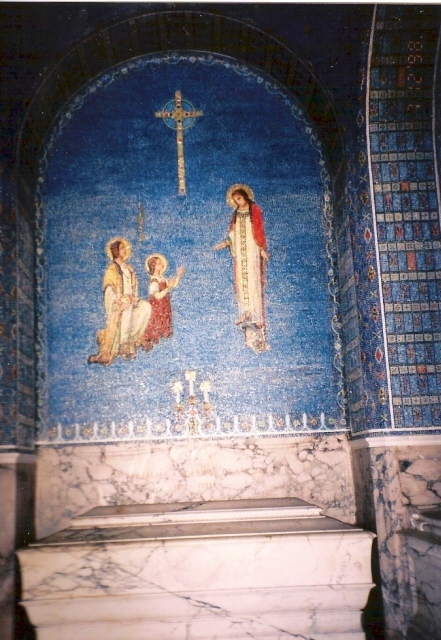 Clark’s father, Senator William Andrews Clark, Sr., is interred in his own grand mausoleum (above) at the Woodlawn Cemetery in The Bronx, New York City. 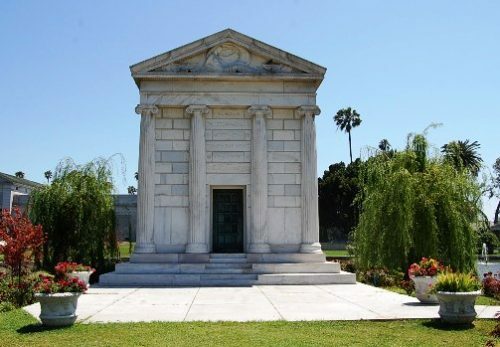 This entry was posted on Friday, June 4th, 2010 at 3:00 am and is filed under Book/Film News, Hollywood Architecture, Hollywood Forever Cemetery. You can follow any responses to this entry through the RSS 2.0 feed. You can skip to the end and leave a response. Pinging is currently not allowed. Thanks, Allan, for another wonderful post. I always wanted to know what the inside of the mausoleum looked like. What a beautiful monument! Hollywood Forever has so many interesting monuments. So thankful the Cemetery is being well cared for and open to the public. A visit to Hollywood would not be complete without visiting H4E. Remember that today would have been Rosalind Russell’s 103rd birthday. Great photo blog on the mausoleum. WOW this is again an amazing story that only you Allan can deliver! Thank You – AND did you get inside? The photographs are just brilliant! I got the interior photos many years ago during an LA Conservancy tour. Having never been able to photograph the interior, I am so happy to finally have a good idea of what it contains. Thank you so much for sharing your wonderful photos of this important and generous man’s beautiful final home. I was allowed inside only once, after a Rudolph Valentino service about 12 years ago. Nice to see it again. Great job, Allan! I notice that Mable died in 1903 and Wm III was born in 1902. Were there complications at the birth that weakened and finally caused her death? Do you know the story? I don’t know but now you made me curious! Wow that is interesting. I wonder what Twain really thought! Mabel Foster Clark, the first wife of W. A. Clark, died on Jan 1, 1903 due to complications from the birth of her son who was born on Dec 2, 1902. What a mega-cool post! Thank you! Loved all the detail, and I ran the inflation calculator. The cost in today’s money would have been $5.94 million. Robert D. Farquhar was also the architect of Clark’s library, built on the grounds of his property in West Adams. Today, that Oscar Wilde collection started by Mr Clark, is the largest in the world . i was not surprised by Mark Twain’s comments until it got to the Boss Tweed part. Perhaps Mr Twain was speaking about Clark pere? while i have not heard any stories about Clark’s business dealings, there are wild stories told about WAC’s personal life, which today we would take in stride but in his own time made him scandalous. Mabel Clark’s complications were “child birth fever”- toxemia. i have been inside; 3 times. You’ve outdone yourself, Allan! A lovely article with wonderful photographs. Great information and pictures! His son, William III, mansion in Clarkdale, AZ just recently burned down. Thanks to everyone here who has contributed information on the Clark family. My boyfriend is John Clark, son of J. Ross Clark II. Walter Clark is John’s grandfather – he died on the Titanic when J. Ross was a baby. J. Ross Sr. was the younger brother of William Clark, the senator. We live on the east coast and have not visited the mausoleum, so again I thank you all for your photos and input. I am fascinated by the Clark family history and would love to hear any more stories you may have. Hi Jill, its a fascinating family. At some point I want to do a story on Walter Miller Clark and the Titanic. There is a marker for him in the J Ross Clark mausoleum at Hollywood Forever. Someone at the cemetery told me that William Andrews Clark was not buried there, at the insistence of his family. However there are photographs of the funeral so apparently that is not true. I wrote a long article on Walter and Virginia Clark for the Titanic Commutator, the magazine of the Titanic Historical Society, about twenty years ago. I wish I knew then what I know now. Hi Don, you are correct there are photos of the funeral so if Clark is not there, he was removed afterward, which I find hard to believe. I’ve done research Walter and Virginia Clark myself and would love to read your article sometime. I cannot believe I missed this. It is even more beautiful than I imagined. Thank you again for this fantastic history. Have you been able to locate the photos of Mr. Clark’s funeral? These would be a good addition to the mausoleum information. Once, while visiting the cemetery, I cautiously walked up to the massive door and knocked a couple of times. No one answered, nobody home? Also, many years ago, noticed an electric meter on a side wall. Wonder… does any one live there? Lots of space, room for a small kitchen in a corner, and an electric coffee machine? Just had my second opportunity to sneek in and take a look around. I have no idea why the mausoleum was open on either occasion, but your pictures are beautiful and convey its opulence. My fortuitous revisit was prompted by an advance copy of a book about Clark’s half sister Hughette that I’ve been reading. The book thus far has been quite a revelation on many levels and identifies one of Hughette’s many homes that she never visited as an estate next to the Santa Barbara Cemetery. Thank you for such a great article and pictures! We visited this cemetery a few years ago and remember seeing this massive mausoleum. I’m currently reading a book about his half sister, Huguette which explains where WA is buried. I thought “hey, I’ve been there!” So I did a google search and here is your article! So cool. Thank you! PS-I clicked on your page first since it’s so very close to ours which is unusual in itself. The family and the cemetery most likely.